Epox Offensiv Combo Special includes the blade and your choice of two rubbers. Epox Offensive is the controlled offensive version of the DONIC Epox series with high speed and excellent control, suitable for all offensive strategies and, due to its light weight ideal to play with. 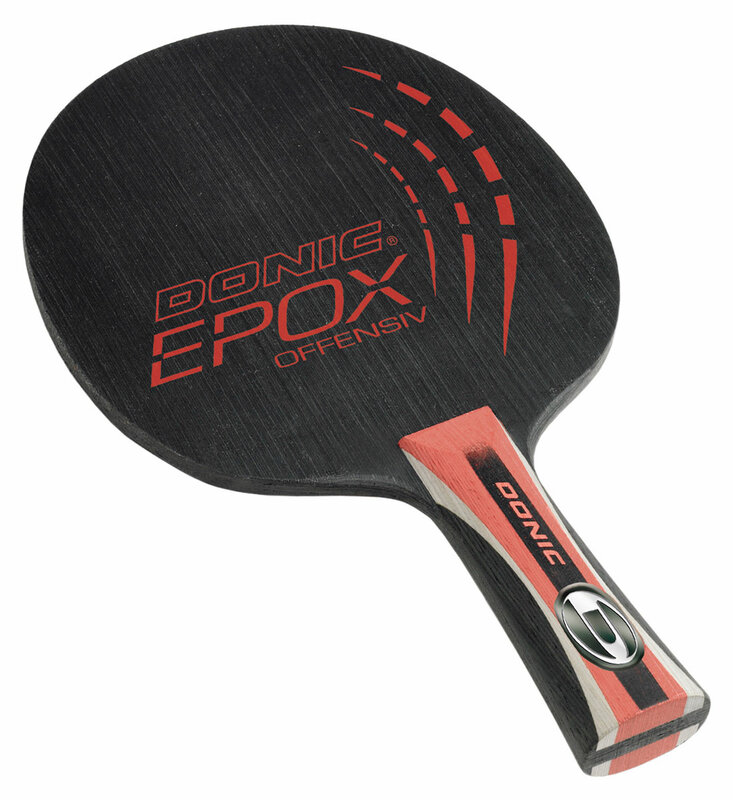 Combined with soft to medium hard DONIC FORMULA rubber, the EPOX Offensiv blade produces outstanding spin, its innovative and elaborate design gives the DONIC Epox Offensive blade unique characteristics. DONIC EPOX System: Each blade a high quality original DONIC EPOX series veneers are not glued with a liquid glue, but with a gluing coat of Epoxyd resin. The five veneers with epoxy coating are pressed together adding heat for 20 minutes. During this process the Epoxy coating liquefies and glues the veneers together. The middle veneer and two intermediate layers consist of monoblade veneers. Only veneers of one piece are used with this monoblade technique. Other traditional techniques often use several pieces which are put together. This means each pressed veneer is only used for one blade resulting in a unique blade of high-quality. The unique method of gluing the plies of the EPOX-blades with Harz-Epoxyd ensures their rigidity. Depending on the particular ply formation, extra power and speed are achieved. The blade has superior control without unpleasant vibration. The edges close to the handle are carefully rounded off. This is the main reason why each blade of the DONIC EPOX series is very easy to handle. Many players hold the handle differently for forehand and backhand shots. Due to the smooth, rounded handle, this presents no problems. The DONIC FINELINE Covered System: An overall sure thing The DONIC EPOX blades have an edge protection made of Fineline wood and are manufactured with the DONIC FINELINE technology. This innovative design has a 360° edge protection, which guarantees that DONIC EPOX blades look perfect for a long time. Due to their thin outer veneers, these blades are also very light in weight. The combination of these refined technologies has created a high-quality product: A new blade series constructed by an up-to-date techniques and carefully manufactured with a love for the detail. DONIC EPOX blade series - READY for TAKE OFF in a new DIMENSION.